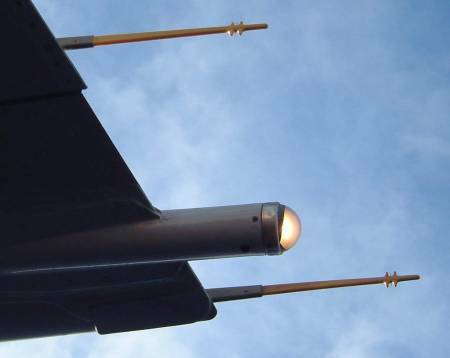 There are static dischargers (either wicks or rods) at the tips of the wings, stabiliser and fin. 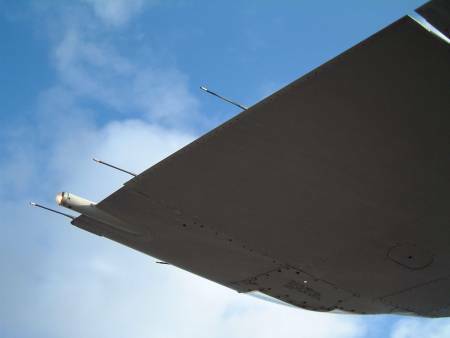 They encourage the static build-up on the airframe to bleed off which would otherwise accumulate and cause radio interference, particularly of ADF & HF. Note that they are not for lightning protection. They should be checked on a walkaround as they are very susceptible to damage from lightning strikes. If you notice that any are missing, you would be strongly advised to get your engineers to conduct a post lightning strike inspection in case other damage has been sustained. 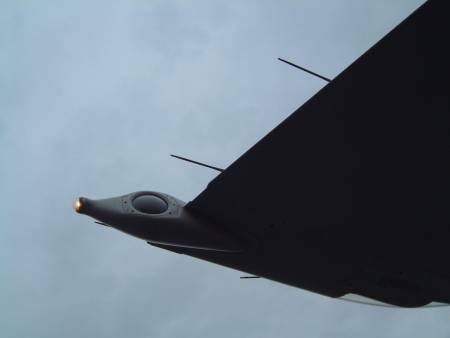 You require a minimum of 2 on each wing and horizontal stabiliser and 1 on the vertical stabiliser all must include the ones at the tips. There are several different types of light farings and static discharge wicks in use.